Cheryl is honored to work with and for global brands such as AT&T, Kaiser Permanente, Gartner, TEDX, Bell, Mass Mutual, Manulife, and more. She also works with small to midsized firms including professional practices, tech firms and more. Cheryl Cran provides leaders and teams (r)evolutionary change leadership skills to lead with 2020 vision with the leading edge tools to build the future workplace today. Cheryl’s research into the future of work, change leadership, technology innovation and generations impact provides data and strategies to inspire leaders to drive transformation in a fast paced world and to create the future workplace TODAY! As an award winning internationally renowned consultant and keynote speaker for twenty years, Cheryl has worked with hundreds of industries, in dozens of countries and with thousands of audiences worldwide working with leaders sharing insights to more effectively lead in these rapid times of fast paced change, increase innovation capabilities, build enhanced agility for individuals and to ultimately inspire organizations be adaptive and iconic leaders in their industries. In her 20’s Cheryl was a high performing senior leader in the banking and insurance industries. Her fast rise to success in those industries resulted in her interest in helping others rise to success and she left to pursue an opportunity of interning for a major consulting firm before establishing her own consulting firm in the late nineties. Fast forward and today Cheryl has a since developed a thriving practice and esteemed global clients who have achieved breakthrough success as a result of working with her. 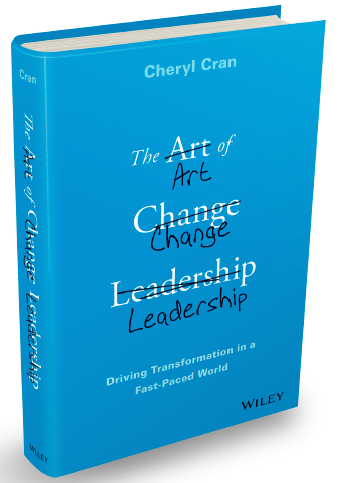 Cheryl Cran is the author of six books including the newest, “The Art of Change Leadership – Driving Transformation In a Fast Paced World” (Wiley) being released in Fall 2015. Her best selling, “101 Ways to Make Generations X, Y and Zoomers Happy at Work” is a global success. It has been translated into several languages and has been the guide for training programs that are currently licensed by partners in over 60 countries. Cheryl has been awarded the Global Consultant of the Year in 2014 by TMI Global and is the Past President of the Global Speakers Federation. In 2012 Cheryl was inducted into the Canadian Speaker Hall of Fame, an honor awarded to less than 30 others. A highly regarded American speakers bureau named Cheryl Cran as one of the top female speakers in North America. Cheryl’s work has been delivered to numerous Universities including UBC, University of Victoria, Duke University Singapore, University of Hawaii, Douglas College, Association of Colleges US and more.